No call out fees. 24hr service. All repair work has a 25yr guarantee. 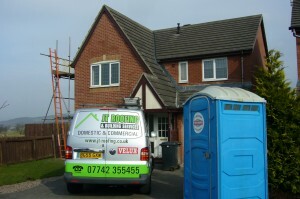 JT Roofing provides you with professional roof repairs skipton for your roof at anytime in all conditions. We assess and photograph the damage and get the repair done quickly. We hold a large range of stock so we can repair almost any roof from materials we carry with us – no lengthy delays waiting for suppliers! all types of Roof Repairs carried out. Come out of the house to find a slate on the floor? JT Roofing are your local roof repair specialist, call us now. In high winds slates, lead flashing and ridge tiles may become loose and let water enter the premises. These may seem like small unobtrusive problems at first but they will lead to untold damage if not rectified as soon as possible. JT Roofing Contractors are the top professional roofers in the area, we can inspect your roof to advise you on the most appropriate repair to safeguard your property and save you money. Your roof should be checked at least once a year, one slipped tile or slate can cause no end of problems. So let our expert roofing professionals inspect and rectify any problem areas for you.